The Nintendo Entertainment System (abbreviated as NES) is a third generation video game console, of 8-bit era, developed and manufactured by Nintendo. It was initially released in Japan as the Family Computer (ファミリーコンピュータ, Famirii Konpyuuta?) (often shortened to Famicom (ファミコン, Famikon?) and abbreviated as FC) on July 15, 1983, and was later released in North America in 1985, in Europe in 1986, and Australia in 1987. In South Korea, it was known as the Hyundai Comboy (현대 컴보이) and was distributed by SK Hynix which then was known as Hyundai Electronics. By itself, it used cartridges for software, and had two controller slots. Numerous peripheral devices such as the Zapper were released for the system. One of the biggest was the Japan-exclusive Family Computer Disk System, which allowed for otherwise normal games but on floppy disk media, as well as certain other features. Some of these games were ported back to cartridge format, chiefly for the purpose of international releases. Eventually the abilities of cartridges overtook the Disk System, though a few floppy-based games continued to be released up until 1992 in varying forms. 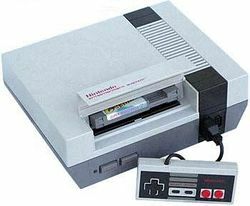 The best-selling gaming console of its time, the NES helped revitalize the US video game industry following the video game crash of 1983, and set the standard for subsequent consoles of its generation. With the NES, Nintendo introduced a now-standard business model of licensing third-party developers, authorizing them to produce and distribute titles for Nintendo's platform. A redesigned version was released throughout 1993, and this version itself had at least three different specs; they were marketed under the same name as the originals, but are differentiated by their model numbers. Japan received the HVC-101, commonly known as the "AV Famicom"; North America received the NES-101 (as two different specs with the same model number), commonly known as the "Top Loader NES". It was eventually succeeded by the Super Famicom, later released as the Super Nintendo Entertainment System elsewhere. 2010 marked the system's 25th anniversary in North America, which was officially celebrated by Nintendo of America's magazine, Nintendo Power, in the November 2010's issue #260 with a special 26-page tribute section. Other video game publications also featured articles looking back at 25 years of the NES, and its impact in the video game console market. In 2016, Nintendo announced the release of a smaller reproduction of the system, entitled the NES Classic Edition. The system has 30 built-in games and the ability to create save states. This device has been released in November 2016. The original model: the Family Computer. An NES with Zapper controller. This page was last edited on 16 January 2017, at 00:34. This page has been accessed 306,541 times.